Fortunately for us some of our trusty volunteers were stirring even on Christmas Eve – All through the dark days of winter our team turn out on a daily basis to make sure that the feeders for the birds and red squirrels have something in them. This photograph was taken by one of our volunteers, Chris Pond while visiting the top viewpoint just before Christmas. You can perhaps understand why the ospreys move south for this time of year. The lake is normally to the right of the big Christmas tree in the foreground – must put some lights on that next year! 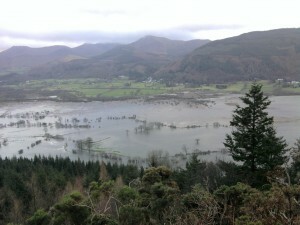 – Whinlatter Forest is in the distance. Unfortunately we have not received a signal from 8A since the end of September 2014 but Number 14 continues to have a subdued life on Bioko. We will do updates on both between now and April. If you wish to help Chris out with his feeding duties or get involved with more seasonal activities contact Nathan or Barbara at Whinlatter Forest Centre 017687-78469. Many thanks to Chris Pond for the photograph and Clement Clark Moore for the poem – ‘A Visit from St Nicholas’.